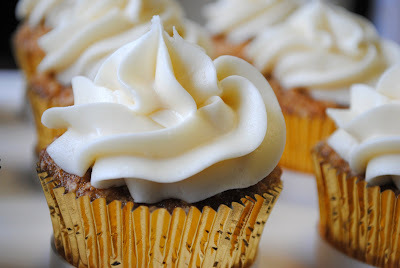 Okay, okay... forgive the cheesy pun but I couldn't resist since I baked these carrot cupcakes in shiny gold foil liners. I discovered a bunch of adorable cupcake liners at Bake It Pretty and I couldn't order just one type so I got a variety of fun designs and colors. This carrot cake is a simple recipe compared to many carrot cake recipes that have extras like raisins or coconut baked in but don't underestimate the simplicity. To me, it's one of those classic recipes that you don't have to mess with - it's already good. The only add-in for this recipe is carrots. It comes together very easily and you probably have the majority of the ingredients on hand. 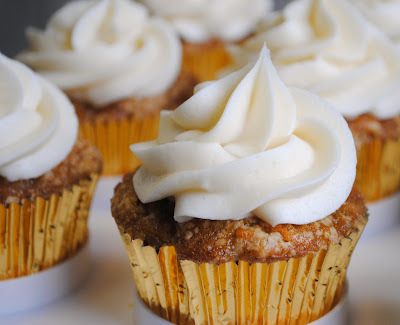 You can also use your food processor to mix up the batter; grate the carrots in the food processor and you just saved yourself a bunch of dishes to wash.
Add a thick cream cheese frosting to these and they are so delicious. Preheat oven to 350 degrees and line 24 muffin cups with liners. Grate carrots and transfer to a large mixing bowl. Add flour, baking powder, baking soda, cinnamon, nutmeg, cloves, and salt and mix together, coating carrots with flour mixture. In food processor with blade attachment, process both sugars and eggs about 30 seconds. With machine running, slowly stream in the oil until the mixture lightens in color. Pour batter over carrot - flour mixture and mix together until all the dry ingredients are incorporated. Scoop into prepared muffin tins (I like to use a cookie scoop to make sure each cup has approximately the same amount of batter so they cook easily and it also makes it easier to control drips). Fill the cups about 2/3 of the way full. Bake approximately 20 minutes, rotating pans halfway through. The cupcakes are done when you insert a toothpick in the center cake and it comes out clean. Cool for about 5 minutes in the pan and then transfer to a wire rack to cool completely. Store cooled cupcakes in an airtight container at room temperature until ready to frost them. Beat together cream cheese and butter on medium high speed until smooth, about 3 minutes. Add vanilla and beat until well incorporated. Add powdered sugar 1 cup at a time and beat on low speed until the frosting reaches the desired consistency and sweetness. Beat on medium high speed for about 30 seconds or until smooth. Transfer to a piping bag and pipe onto cooled cupcakes with a large star tip or frost as desired. These look wonderful! I might have to add them to our Easter brunch menu. It looks great in those cupcake liners. My mom loves carrot cake. I am thrilled that you posted this-my husband's birthday is next month and he requested a carrot cake! I am excited to try out this recipe. Yum I love carrot cake! These look fantastic and i love how the frosting is thick with lots of cream cheese!